Since we first wrote about Smokehouse 101, there has been something of barbecue explosion in the west – see here and here. 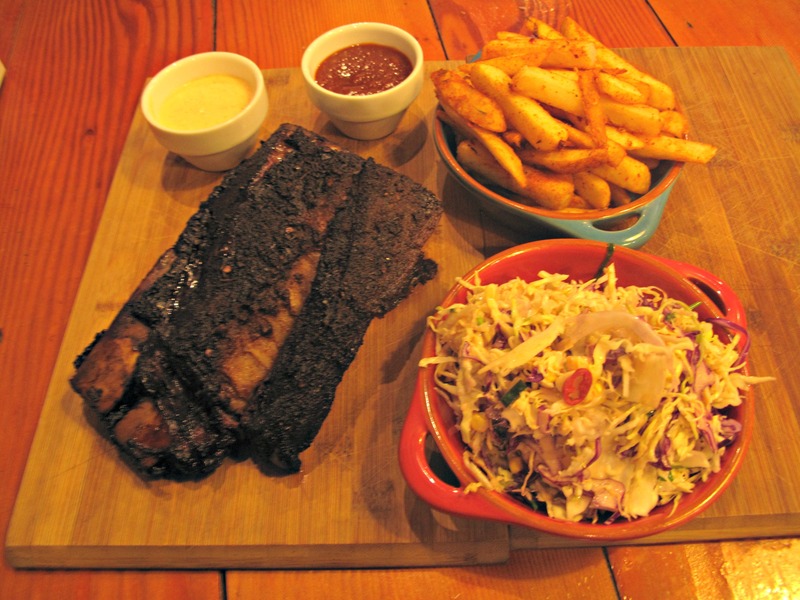 In the meantime, Smokehouse 101 (101 Rosamond Road, Maidstone) has quietly gone about its business, not perturbed by any perceived lack of any inner-city vibe or a trendy list of craft beers. On the Saturday night I visit for indulgence, the place is doing a roaring trade and I like the ambience that is a friendly place without graces and airs, and where walk-up trade is normal. As ever here, the chips ($5) are a little on the average side but go good with the chilli mayo and a splendidly boozy BBQ sauce. The coleslaw ($5) is better this time out than we’ve received on previous occasions – more finely chopped, nicely dressed and with slices of red chilli and cubes of mandarin. Half a rack of beef ribs ($35) is amazing, superb, wonderful. There’s a LOT of meat surrounding those two brontosaurus-style ribs, much of it underneath them. The meat is tender, smoky, delicious – and there’s not much fat. I alternate mouthfuls with and without that boozy sauce and love every lip-smacking minute of my feast. All of which begs the question: Why, when beef ribs are available, do people persist in ordering those of the pig and sheep variety? The latter two, it seems to me, are often over-priced, ungenerous and way too polite.